Presumptive Republican nominee Donald Trump has overtaken former Secretary of State Hillary Clinton in the crucial swing states of Florida and Pennsylvania, and is tied in Ohio, according to a Quinnipiac University Swing State Poll released on Wednesday. 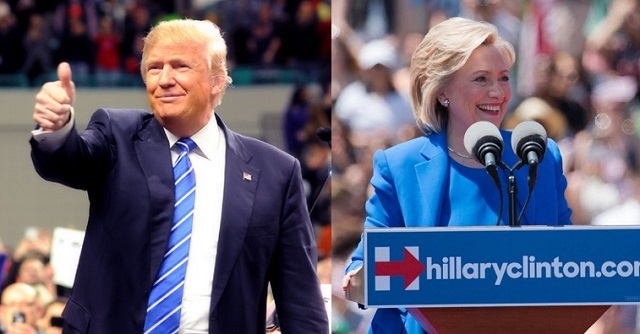 The latest poll in the 2016 U.S. Presidential election has Trump leading Clinton 42% to 39% in Florida, 43% to 41% in Pennsylvania, and tying in Ohio at 41% each. "Donald Trump enters the Republican Convention on a small roll in the three most important swing states in the country. He has wiped out Hillary Clinton's lead in Florida; is on the upside of too-close to call races in Florida and Pennsylvania and is locked in a dead heat in Ohio," said Peter A. Brown, assistant director of the Quinnipiac University Poll. "While there is no definite link between Clinton's drop in Florida and the U.S. Justice Department decision not to prosecute her for her handling of e-mails, she has lost ground to Trump on questions which measure moral standards and honesty." By wide margins, voters in each state agree with the statement, "The old way of doing things no longer works and we need radical change." Voters also agree by wide margins that trade agreements with other countries have hurt them and their families' financial situation. Voters still say Clinton is more intelligent than Trump and that she is better prepared to be president. But Clinton has lost her wide lead over Trump for having "higher moral standards." And Trump widens his lead over Clinton for being more honest and trustworthy. Trump is leading Clinton 42% to 39% in the Sunshine State, showing that the real estate mogul has seen significant gains when compared to just last month when Clinton was ahead 47% to 39%. Florida voters say 54 - 39 percent that Trump would be better creating jobs; 49 - 45 percent that he would do better on immigration; and 57 - 35 percent that Trump would be more effective against ISIS. Trump would be better creating jobs, Ohio voters say 54 - 39 percent. Clinton would be better on immigration, 48 percent of voters say, while 45 percent say Trump would be better. Trump would be more effective against ISIS, voters say 51 - 40 percent, but Clinton would be better responding to an international crisis, voters say 50 - 43 percent. "A majority of Ohio voters, 53 - 44 percent, say the 'government has gone too far in assisting minority groups,'" Brown said. "The same voters agree 72 - 25 percent that 'Prejudice against minority groups is a big problem in the United States today.'" The gender gap is shrinking in Pennsylvania, where Clinton leads 43 - 39 percent among women, down from 50 - 34 percent in June, while Trump leads 48 - 37 percent among men, compared to 50 - 33 percent last month. He leads 82 - 5 percent among Republicans, as Clinton takes Democrats 82 - 9 percent. Independent voters are divided with 39 percent for Trump and 36 percent for Clinton. White voters go Republican 51 - 33 percent, while non-white voters go Democratic 72 - 12 percent. "As she battles for every vote in a tight race with Donald Trump in Pennsylvania, Hillary Clinton has to look at the erosion of support from women as a red flag in a blue state that could carry one of the candidates to the White House," said Tim Malloy, assistant director of the Quinnipiac University Poll. 982 Pennsylvania voters with a margin of error of +/- 3.1 percentage points. Photo credits: Trump and Clinton campaign photos.